PAPERFOX - cutting, punching, folding: Why slippage occurs in cylinder die cutters? Why slippage occurs in cylinder die cutters? Flatbed die cutter cut the full size of the sheet simultaneously. The cylinder of the cylinder die cutters roll above the material to be cut and the cutting made under the cylinder. Unfortunately, the cutting happens not at one point, but beside the cylinder a few millimeters. 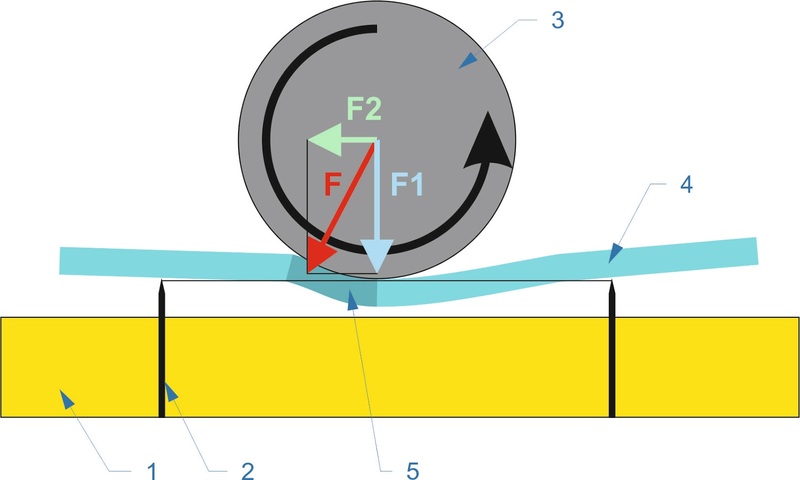 Consequently the cutting force (F) is not perpedicular to the surface there is a longitudinal component (F2) as well. This force causes the longitudinal sliding effect of the sheet to be cut in cylinder die cutters. Now you need to explain why it is not a problem in your design.